This time its Varios. Yes even the once dominating Varios are starting to be sent off. S407 GUB as the last surviving Tamar Link Vario. 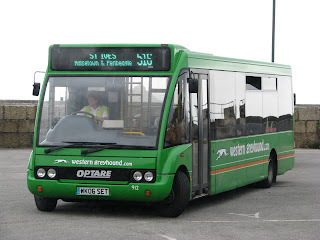 Also buses that once worked at Torpoint the R-VPU Marshall bodied Varios are being scrapped. Again these were very nice buses, i preferred these to the Plaxtons and again is a shame these are going. I never thought I'd be saying this about a Vario! With thanks to David Shepard we can now report that sadly C417 HJN has been scrapped at Henry Flashman's. Dave managed to find out that 6 Olympians have now been scrapped, mainly being the A-THW batch of Olympians that have worked in Cornwall for many years. On his trip up there to collect some memorabilia he also sited A752 VAF, A great shame as these have been on the roads of Devon and Cornwall for a whole 26years of service. Such a bad way to bow out being scrapped after all those loyal years! This leaves only 1 of the batch still in service, this being A753 VAF. She may be looking tatty but she is still on the road, but for how long! I am very hopeful that at least one of these will be preserved but I suppose we will have to wait and see! 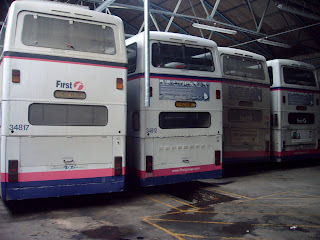 Also more news in from Anthony of Cornwall is that both of the remaining A-FSA batch of double door Leyland Olympians have now been withdrawn and are idle at Camborne depot. Though from what I gather B112 MSO is still working so she is the last of these Alexander bodied Olympians to still be in service. Also that 3 of the D-GHY Volvo Citybus' are also going to be scrapped and are withdrawn at Helston depot, again waiting for disposal. 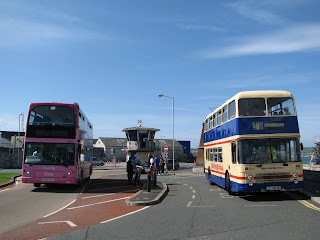 C412 and 413 HJN are still idel in Plymouth. C412 HJN has been sold onto an Essex preservation group though they haven't picked her up yet while C413 seems to have no future as far as I know. Things really are going downhill fast in the area. It won't be the same without our lovely deckers! While waiting for my bus back home at Royal Parade today, who drove down but Derrick Cuff! 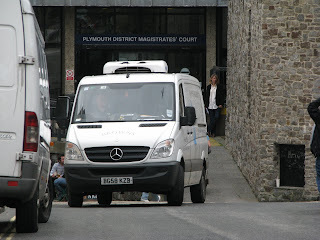 But not in a bus, his '58' reg Mercedes Sprinter! I waved at him as he went past and he pointed he'd pull over up at the Car park! I was soon aboard the beast and we were off on deliveries! While doing the rounds with him I must admit I can see why he's enjoying it. Total freedom, your actually allowed to turn left when you want instead of what restriction your on. You can stop wherever you please, take whatever route you want, not have to pick up passengers. It was so much less stressful and less repetitive than bus driving. Even the vehicle was fun to drive. This Merc flew along even with a load of meat in the back! I particularly like the branding on the van as the picture illustrates! The pole that was put up in Cremyll months ago when re-surfacing was taking place is finally being used! it has lied dorment since then but now one of the latest real time systems has been put up! Only problem is its only showing information for the 81Cs. Also is it really neccisary. 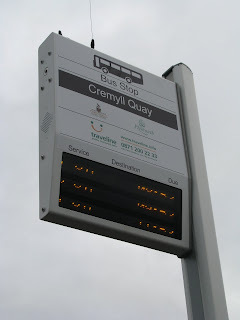 If its only showing information for 1 bus why not just look at the timetable? It'll never be late because most of the buses have a 15 minute layover. And it doesn't state destination to tell you how far the bus is going! But oh well! Good try. The fate of 181 has now been decided. 181 has been lost by FDC and has gone to Western Greyhound! Reasons for this move are that Western Greyhound have promised low floor vehicles on the route in the shape of some Optare Solos, and also that the subsity request was £400 lower than that of A-Line Travel's offer for the service. Shame to see that A-Line lost this opotunity as this could have been a 'big break' for them to have a good profit making route. Also 181 was a major problem for A-Line when it first started forcing them to change the route as A-Line couldn't compete with First in this area. 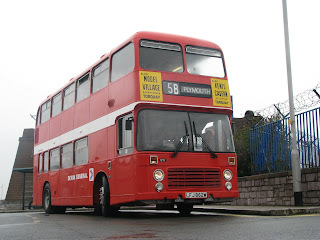 Most of the route had always been A-Line territory that was only served by the old 270. This is what forced A-Line to change to what is now the 80A. All the same good luck to Western Greyhound and will be nice to see some more variety brought into Torpoint. What seems like only days ago, has infact been a considerable amount of years. The Olympians are gone along with the Gardner. Yes it is a point I have gone over far too many times in the last few weeks but it is a major thing in the life of out little depot. Picture of the best of times is of all the sisters together having Sunday off in Torpoint depot. The sisters were always looked after well and put into dry storage whenever possible. Its also nice just to note all the minor differences they have picked up over there lifes. None of them are quite the same, particularly C413 HJN with no top lights. Also C412 the only one to have a grill on the engine cover. The LAST Olympian video is now uploaded. Also to note I thought long and hard for the right music for the occation, hope you share my view with this piece. In response to Mr Farley's comment on the last post I was in fact on the bus that he noted working!! Another late addition to the depot is East Lancs bodied Dennis Trident WJ55 CRZ, 32762. This bus up until now was most commonly seen operating the X80 on which this batch of buses were brought up from Cornwall to run. This batch of Trident was of course initially bought to run the 89/90 from Truro to Newquay, but soon found their way up to Plymouth, in a swap with the remaining Ex-Airbus Volvo Olympians. 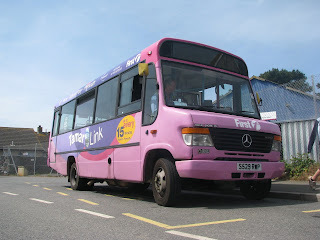 She was repainted into the 'Save the Children' livery early last year, and will be a change from the normal pink '54' reg tridents that currently operate at Torpoint. 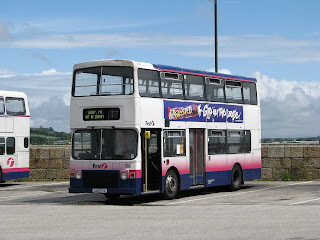 Though she has been 'transferred' to Torpoint she will still often be used on Plymouth services, she is simply here as a 'spare' bus when another bus is out of action. The bus she is currently standing in for is newly acquired K804 ORL which had a collision with a lorry and is needing work done to her before she can be put back into service! A good start for them! 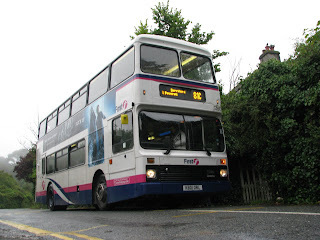 The bus does seem very good though, especially on hills which she flew up on the run from Cremyll. While walking through the village today, what passed through but ANOTHER Volvo Olympian, this time K801 ORL. She has joined the fleet now, along with sisters, K802 and K804 ORL. is that K804 ORL is currently off the road and will be for a sustained period of time following a collision with a lorry!! 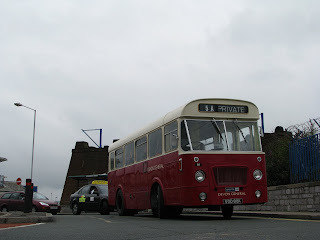 This will mean that the last Leyland Olympian C413 HJN will be in her place, and will cover for her until sh returns. I will try and find out how badly K804 is damaged to let you know roughly how long C413 has to live! But while she is here, I'm definately making the most of her, before its too late! Over the last week I have been on holiday in sunny Birmingham. 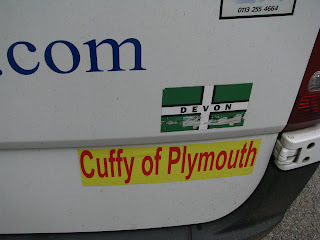 This blog will simply be on the transport parts of the holiday. 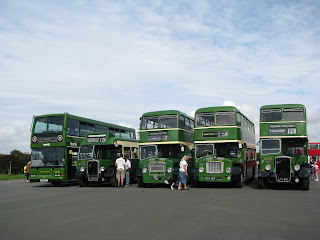 Firstly was a visit to Wythall Transport museum. This had an array of mainly Midland General vehicles all looking imaculate. This also included a trip on an old Bristol L around the local area. I also had an afternoon in Birmingham City Centre to have a look round the variety. Its quite nice seeing what else is on offer, and workings were quite different to what Plymouth is this days, best of all there wasn't a Vario in sight!!! As I was saying Tridents were the mainstay of the fleet, along with newer Enviro 400s. 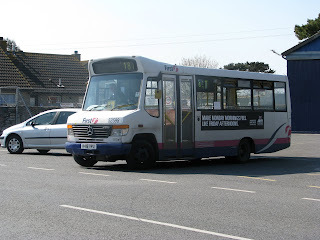 The single deck fleet was covered with Mercedes 0405s which I would say were actually nicer than the more modern Citaros, while still being low floor. 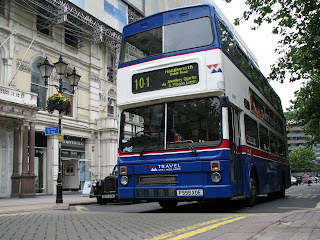 Though as is always associated with Birmingham, the thing I really came to see were the MCW Metrobus'. Well before I had been talking to someone who lived in the area, who was saying that the buses are now very rare. Though this seemed to be on a completely different scale to what I would call 'rare'. If I was to call something rare here in Cornwall it would be you'd be lucky to see it once or twice in the day. Yet there were Metrobus' operating every 10minutes!! Yes in comparision they are rare I suppose. There are hundreds of Tridents, Enviros and Geminis on show, but still not what I would describe as rare. 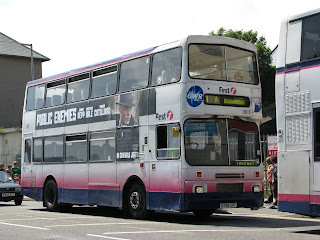 This meant I got a lot of rides on many of the E and F reg Metrobus'. Though in the last hour on a different route than I had been on previous, one of the real survivors showed up. This was one of the much older ROX batch, this one being ROX 654Y. This beast realy did seem that bit better than the newer ones, sounding and going much nicer than the others. Though next thing I really picked up on was the way the system of buses work differently in the city. Instead of operating a fare stage system, National Express Travel West Midlands have flat rates. This means that it is the same price for every single journey, however long it is. Also all day riders are the same price, instead of being zoneal like the ones in Plymouth and surrounding area. This meant travel was extreamly cheap. Though while buying my ticket I did get some funny looks when I went upto the driver and said in my normal fashion "Hi there, could I have a child day ticket please?" It had to be explained to me that the driver doesn't deal with the fares. Instead there is a hopper as you board the bus where you have to insert the exact fare into the hopper, then while you proceed down the bus, there is a ticket roll which produces the ticket, meaning that boarding the bus is a constant flow which definately speeds the process up. Though the drivers seemed extreamly impacient. As soon as the customer had boarded, even though the fare had not been paid, the drivers already would have pulled off. This was even the same when OAPs were boarding which I thought was particually dangerous, and many of them struggled when they were boarding the bus. Just made me see that we take out much more friendly and laid back drivers in the southwest for granted, though maybe we could pick up tips from a ticket system like this? The only people that would disagree are the people than bring tenners onto the bus!! No way would they be allowed to travel in Birmingham! As always pictures and videos are avalible in the normal places of the trip. Day 2 started off slightly later for me because of the lack of public transport to the village on a Sunday. This meant a bike ride down to Cremyll for the 9O'clock Cremyll ferry. My first job of the day was again selling programs along with getting all of the 100 odd buses attending into position along the Hoe. I directed them from near the start down towards Gary Furness and co who would direct them into their bays, trying to group together the similar ones such as the two Marshall Bodied Bristol LHs VOD 88K and sister VOD 124K. to be the piolet with Terry Bennet aboard his wonderful Bristol LH VOD 88K which had been newly repainted in this superb Devon General Livery. 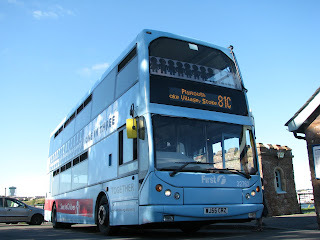 This bus had recently gone through Major restoration after from retiring from work on the Channel Islands. This was a brilliant ride down to the ferry with Terry driving the journey there and James Pratt with the return journey. As you can tell from the picture the weather was somewhat damper than the Saturday, but didn't dampen the spirits whatsoever! On return I had another run down to the ferry, again this was on LFJ 844W which was being regularly used on this route because of her heritage with this route, following much of her old route 81 and some of the 80. You can see again the comparison with the weather from the day before! she'd be in fine fettle once more. 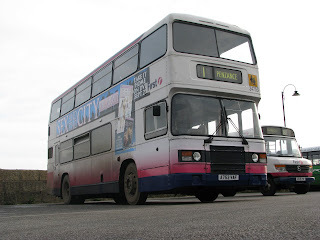 The picture shows Cuffy standing outside his Ex Torpoint Ferrybus, which he used to drive daily while working at Torpoint. Though on the way back to Plymouth I remembered that I had been booked out with James Pratt aboard LFJ 862W down to the ferry once again! This meant as soon as we returned it was a run across the Hoe where James was already set to depart so as soon as I arrived we were off! And my after being on sister LFJ 844W for the morning I was stunned how fast LFJ 862W went in comparison. She has been re-restored, into Devon General Poppy Red after a fire at her storage base. At the same time she also had a reconditioning. What a fantastic ride, thanks to James. On the return journey we had Ian, owner of XDV 608S the VR which WNPG member Mike Hudson used to own. 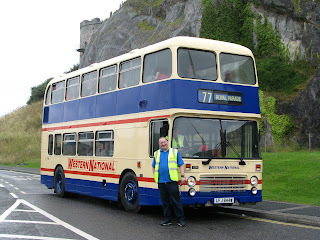 He also owns an ex Plymouth Leyland Atlantean and a Leyland Leopard. 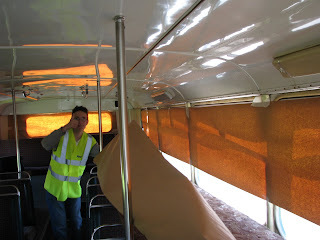 He says that restoration should start in the near future, firstly with re-paneling, though mechanically she is already a fantastic bus. Also on this run, a bumped into Mr David Sheppard, (that man who does Saturday night radio!) from BBC Radio Devon, who was aboard LFJ 862W, (you might just be able to make him out getting off the VR). I had a quick chat with him before the journey back. I also then joined him on a trip to Yealmpton on a bus sister to his, this being Bristol SU 336 EDV, with a very enjoyable conversation with him all the way! And on quite a stunning little bus too! The following picture are from Saturday, this being the line up of 5 (well 4 really) Western National buses including the newly painted Trident in the special Anniversary livery, which earlier in the day had been having technical problems. Apologises for layout but Blogger is very annoying sometimes for things like this! Including not being able to delete pictures! Yes it seems like a lifetime ago now! I've been on 'holiday' up in Birmingham the past few days and have been unable to blog, so I have a bit of catching up to do on my part! fluorescent jacket, selling programs, being on the buses as pilots and on other tasks in the day. ly painted OTA 290G. This would be the premises for the buffet for the officials over the weekend, and to take refuge from the crowds in! We were handed 5 rolls or brown paper and told to cover all the windows. Typically the rolls weren't wide enough to do each side in 1 sweep and this meant having to do each set of windows twice, just making it that little bit more challenging. It was very much done in 'Blue Peter' style but the job was a goodun and it would keep the sun out for our food! Picture shows Louis with our half completed job of OTA. is condition and had a good look at her. You could see in his face the excitement when he saw this beast, after not seeing her for around 4-5 years. I then had time for some pictures, and to have a bit of lunch, which turned out not to be the buffet. Some confusion had taken place and well the buffet never resulted leaving our hard work worthless, but not to worry, we got a free bacon bap out of it! I then had another trip down to the ferry again on LFJ 844W before my next run. 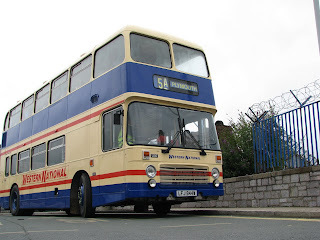 This would be on London Leyland Titan WYV 6T which had traveled all the way from Essex to attend the rally. This was a journey of 13 hours for the two chaps who brought her and I must congratulate them and the bus on making it all the way in one piece! They said at the best of times she was only about to do between 40 and 45mph all the way. 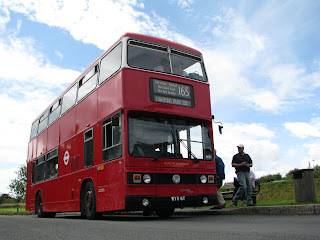 Though I had a fantastic ride with them out to Yelverton on the old 85 (now 84) via Mutley Plain instead of via Tavistock Road. Picture shows this wonderful but sat at the bus bay in Yelverton. After this trip it was around 3ish so it was time to sell off the last of my programs on which I took £40 at the end of the day, and to help out at the WNPG stall with Silvia. There was also some more time to have a chat with a few people before closing time. A very sucessful 1st day!